One of the foods I didn't like much when I was a kid was brussel sprouts. Little balls of cabbages? No, thank you! I remember my dad cooking them up and serving them with a little clarified butter for dipping. Not the best thing for you, but at least the butter somewhat masked the nasty taste. I could maybe get one or two in before calling it quits. About a year ago, I decided to buy some brussel sprouts at the store to see if I still had that horrible distaste for them. My husband was also a little leary because it's something that he never had and wasn't keen on ever trying. He's been pretty awesome at trying new foods though so we just dove right in. The way I cooked them worked because we now have them every couple months or so! There are quite a few different ways to prepare brussel sprouts, but I've settled on just a couple of them so far. One way is to roast them, but I'll get to that later. This past time, I cooked them in a pan with some bacon and red onion. 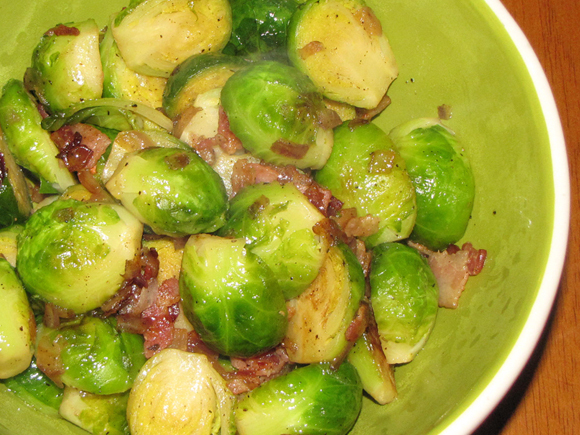 (There isn't too much bacon, but it's just enough to bring a nice flavor and texture as an accompaniment to the sprouts.) The sprouts are sauteed to bring out their natural sugars and the other ingredients help finish cooking the sprouts and add so much flavor that this is one side dish that everyone should at least try...even picky husbands. 1. Prepare sprouts by removing outer rough leaves and cutting off a little bit of the bottoms, be sure not to cut too much or the sprouts won't hold together. Cut larger ones in half lengthwise. 3. Dice bacon and cook in pan until just about done. (You'll finish cooking it later) Drain on paper towel, reserving about 1/2 TB bacon grease in pan. Set pan aside to reuse. 2. Bring pot of water to boil and add sprouts. 3. Blanch (in two batches if necessary) in boiling water for 2 minutes or until just starting to soften. 5. In same pan that bacon was cooked in, saute onion over medium heat in bacon grease until starting to soften. 6. Add bacon and sprouts to pan with onions and cook over med-high heat until bacon is crisp and spouts are starting to brown. Be careful not to burn bacon and onion - turn down heat if this happens. 7. Separately, stir broth, vinegar and brown sugar together. 8. Add broth mixture to pan and stir, scraping bottom of the pan. 9. Cook over med-high heat, stirring frequently, until liquid is reduced and sprouts are tender.